My oldest granddaughter is 15, and thanks to North Carolina’s HB2, if a 15-year-old boy in her school identified as a girl, he would not be allowed to play on her sports team or share her locker room. I for one am glad that North Carolina, my home state since 2003, has taken a stand for commonsense, for safety, and for privacy, yet the NBA is punishing the state for protecting its residents, announcing that it will pull next year’s All Star game from Charlotte. What hypocrisy; what bigotry; what intolerance. The NBA is now the National Bullying Association. 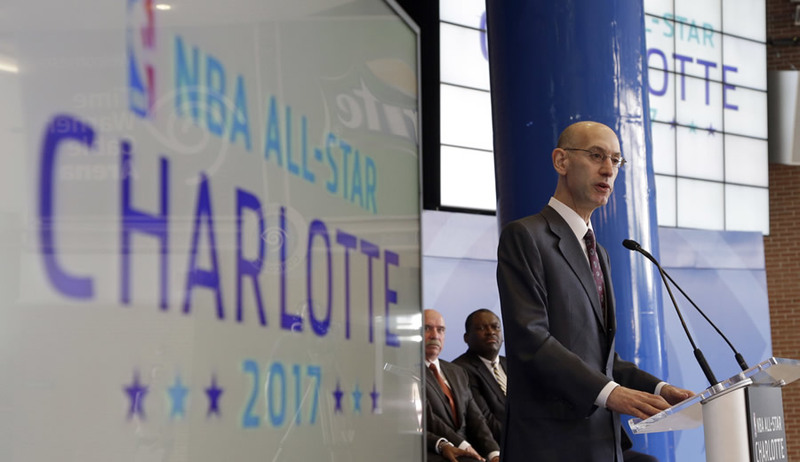 Let us not forget that when the NBA decided to bring the All Star game to Charlotte, the laws were just as they are today: Men were expected to use men’s bathrooms and locker rooms and women were expected to use women’s bathrooms and locker rooms. If this was so terrible, why did the NBA agree to bring their annual, weeklong, festive event here? The State legislature simply reversed a radical bill passed by the Charlotte City Council earlier this year, a bill which had effectively rendered all public bathrooms and locker rooms gender neutral. The State simply put things back to where they were before. Why then the outcry from the NBA? Why punish the state for moving things back to the way they when everything was fine? These are the very abuses that North Carolina is seeking to prevent, and while the state cannot stop a private business like Target from engaging in this dangerous social experiment, it can take a stand on a statewide, public facility level. Yet for taking this stand, the NBA has declared North Carolina unworthy of hosting the 2017 All Star game. Shame on Adam Silver, the Commissioner of the NBA, and shame on all those who stood with him in this disgraceful decision. What does the NBA say to them? In reality, the NBA has sided against these very values, unless the words “diversity, inclusion, fairness and respect” have taken on a whole new meaning, since the NBA is showing zero tolerance for any diversity of views, absolute exclusion of all those who want to keep a biological boy out of a girl’s shower room, complete unfairness towards young ladies who would now be forced to compete against young men in sports, and utter disrespect for the commonsense values of the clear majority of the residents of North Carolina. As I asked in a previous article, would the NBA allow a star like LeBron James to play in the WNBA if he felt he was a woman trapped in a man’s body? If not, why are they forcing schools to do what they would never do? As for showing a “willingness to listen and consider opposing points of view,” you don’t demonstrate this by pulling a previously-scheduled, major event out of a city. This is what is called bullying, punishing, and intimidating. Ironically (and hypocritically), LGBT leaders, who frequently share poignant stories of the bullying they have experienced, are now cheering on the bullying of the NBA. The bullied have become the bullies. In terms of bathroom access, there’s no fundamental difference between Charlotte and New Orleans, yet Charlotte is being punished for refusing to bow down to the goals of radical gay activists. Not only so, but both North Carolina and Louisiana, along with 22 other states, have filed suit against the federal government, protesting the Obama administration’s gross overreach in this very area — trying to force schools to comply with radical LGBT activism — yet Louisiana is being rewarded and North Carolina is being punished. That leaves only reasonable course of action: Stand up to the bullies and ride out the storm until common sense prevails again. The bullying must ultimately backfire. The NBA can only bully those who are willing to be bullied. I am not willing. NC got along fine before the NBA put a team in Charlotte. If the NBA is really opposed to HB2, they should move the Charlotte team to a state that is pro-lgbtq. Moving the all-star game is nothing. Do the NBA executives like to use the ladies’ room? Do they dress like a woman when they use it? Is Adam Silver a transsexual, or a homosexual? Is the NBA open to women? Since they want women and men in restrooms and locker rooms together, you might think they would allow women the opportunity to play in their league. Did anyone read the entire bill? It’s not just about bathrooms. HB2 takes away your right to sue if discrimated against on your job. There’s more to it besides bathrooms. I’m a teacher and apparently you don’t realize how many students are struggling with their sexual identity. I’ve had a boy on the cheerleading squad that was mad because he couldn’t change in the girls dressing room with the other cheerleaders. He was not allowed in there period. I’ve had a student who came to school dressed as a girl and would sneak into the girl’s restroom to do his hair like the other girls. Well the girls got mad at administration for kicking him out. They wanted him in there to help with their hair. ( go figure). I’ve been at asocial event and used the restroom and there was a transgender in there. I was not comfortable with hat but I did realize that if he would have gone into the men’s restroom dressed like that he would have probably gotten beat up. My question to you is. “Where did they go before all of these bills were written?” This issue is not new. Even the Holy Bible speaks about homosexuality and women should not wear that which pertain to men and men should not wear that which pertain to women. Deut 22:5. I follow that everyday. I wear a dress or skirt every day. I don’t own a pair of pants. In closing, we have got to stop letting the media and victious people lead us. We as Christians are required to love our neighbors and we love ourselves. We are to hate the sin, not the person. And to you Mr. Brown, I’m very disappointed that you have reverted to name calling. “National Bullying Aasociation”. I thought you were better than that. If what you say is true, then America is rotting. Loving your neighbor has never included ignoring or tolerating their sins. This issue is, literally, going to die off with the current over-50s generation. Even in evangelical churches in the United States you will not find more than a smattering of individuals who are going to accept treating LGBT people the way American evangelicals have distinguished themselves for doing. God will never accept lgbt people. Neither will God accept those who accept lgbt people. Anyone who endorses lgbtqfsp cannot be a Christian, which means that those who do, and pretend to be Christians, are lying about their “Christianity”. You’re right, churches in America are completely dead to the good news of Jesus Christ, twisting and turning it into powerless garbage. With that comes a whole host of consequences, some of which we are already seeing, with so many stuck in one form of addiction or another. The glory of God and his word will outlast this falling away though, regardless of whether or not people ignore the calling and love darkness rather than light. Yup, paganism is on the march in the west. It may well be very soon that we see “Ichabod” inscribed across the lintels of church buildings throughout this land. But God will not leave himself without a witness. God will sort this out before we all find our final place in eternity. I don’t see the NBA any more bullying than others on other subjects and even this one. We need to love each other and pray for each other. I don’t like the idea of trans-genders in locker rooms or bathrooms, but I can use the door and lock it. I can use the family restroom where it is private. I have options and can stop going where I don’t have that option. I don’t feel discriminated against because I make a certain choice by not going to NBA ball games or Target or anywhere else that chooses to favor ideas that I don’t agree with. That is the American way – freedom of choice. I never agree to bullying someone to my ideas. The few percent that live outside the norm have to start understanding that by being outside the norm – not everything will go their way 100% of the time. We need to live together and respect each other. Thank you Michael Brown for you sound voice about this issue. I have shouted from the mountain top and continue to shout that I do not want men to have the opportunity to be in the bathroom with my daughter or with me. It seems utterly ridiculous that we are even having this conversation.